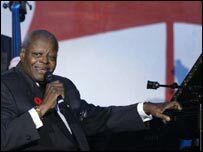 As a child, Oscar Peterson – who has died at the age of 82 – began learning to play the trumpet, but a bout of tuberculosis caused him to switch to the piano. This proved to be a blessing, since he was to become one of the most popular virtuoso jazz pianists. His hallmark was the capacity to play at lightning speed, while maintaining the ability to swing. What’s more, he could play in a variety of jazz styles. Peterson was born in Montreal, Canada, in August 1925, and was the son of a West Indian railway porter. His father, a strict disciplinarian with a love of music, had him classically-trained, both at the Montreal Conservatory and by private tutors. He switched to jazz after listening to Benny Goodman on the radio and, at the age of 14, he won first prize in a talent competition for amateur acts. This led to spots on Canadian radio and to work with dance orchestras around Quebec and Ontario. His first record, at 19, was the single I Got Rhythm, arranged in a boogie-woogie style. Peterson then joined one of Canada’s most popular bands, the Johnny Holmes Orchestra. He resisted offers from the United States, most notably from Count Basie, until he was picked up by the impresario Norman Granz, who was in a taxi when he happened to hear Peterson playing live on the radio. Granz stage-managed Peterson’s New York debut, calling him up from the audience at Carnegie Hall. The speed and vitality of his subsequent performance won him a standing ovation. Influenced by the virtuosity of jazz pianist Art Tatum, and the silky vocals of Nat “King” Cole, Peterson explored a wide spectrum of American songwriters with his trios and quartets over the next 40 years. He also played solo and as an accompanist to many of the great names of the day, including Louis Armstrong, Duke Ellington, Stan Getz, Billie Holliday, Ella Fitzgerald and Charlie Parker. Peterson had his critics too, however. Some avant-garde jazz artists in the 1960s found him improvisationally shallow. But a tour of Europe in the 1970s convinced him that he was right to ignore the suggestions that he was “in a rut”. Jazz critic Benny Green wrote in 1971 that “in addition to incisiveness and clarity of mind, Peterson has developed a most subtle command of dynamics”. “The ebb and flow of his attack can suggest orchestral influences quite distinctly,” Green continued. In 1982, Peterson began performing with Herbie Hancock, as a piano duo. On stage, he was relaxed and friendly, although he insisted on silence during his concerts, once walking off for half an hour when he felt the audience was not listening. He was increasingly troubled by arthritis and in 1993 he had a stroke which restricted the movement in his left hand. Some critics felt, nevertheless, that this made his music more emotionally compelling. And he continued to leave a lasting impression right up until his death. Only last month, the Canadian Songwriters Hall of Fame announced it was to present the star with its Founder’s Award in 2008, to celebrate “a brilliant jazz pianist and composer” who showed “musical dexterity and energetic performances”. According to CBC, Peterson was married four times and had six children from his first and third marriages and one daughter, Celine, with his fourth wife, Kelly.